I found my thrill walking the Monument Trail in High Point State Park recently. The path along the forested mountain top at the top of New Jersey at 1,800 feet offered me palettes of color and texture that only the shallow-soil ridges of High Point can. Golden vistas of New York, Pennsylvania and Sussex County await the woodland explorer seeking gorgeous views and an enchanting walk. Spectacular autumn view at High Point, New Jersey's Everest, looks over the Delaware River. I park at the Nature Center and enter the woods on the red/green blazed trail straight ahead. 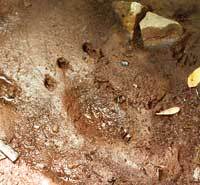 As I stride blithely along, my glances at the ground increase until I am studying the leaf litter adorned with brightly-colored fungi, acorns, critters, critter prints and other memorabilia of the forest. Mushrooms everywhere! A splash of bright red emetic Russula caps with white stalks contrast with brilliant green moss and tiny brown kiss-shaped mushrooms. The canopy of chestnut and other oak species, pitch pine, red maple and American beech stretches much of the 3.7 mile distance of the trail, as does the "Pigskin Poison Puffballs" (Scleroderna sp). They're little beige balls with dark brown warts, but cut them open and they look like a chocolate truffle. Beware! They'll make you sick. Sulpher-yellow clusters adorn a boulder near a chestnut oak with its chunks of bark you can reach out and shake hands with. I descend on a quarter-mile stone staircase sculpted by the Civilian Conservation Corp in the 1930s. The Corp delineated Monument Trail along the three-mile wide Kittatinny Ridge. Blueberries and huckleberries surround me; I eat as I go. Soon the staircase sweeps to the right, a grand gesture. The forest is still. Where are the birds? I hear the gurgle of a stream ahead and a call of one bird, a long questioning trill. I wonder, who hears me? As I hike through the berries, trails shoot off to the side that lead to majestic views. The undergrowth is filled with witch hazel shrubs with fuzzy leaves askew on their stems and small green nuts on the branches. Skinny mountain maples with green and white striped trunks and huge leaves decorate the edges. This is about its southernmost range. I begin the easy climb that seems to go the entire trail. How can a loop be all uphill? I leave the Chestnut Oak Forest and enter the Pitch Pine-Scrub Oak Forest that exists in only the highest elevations. Scrub oaks abut the path, living in the thin soil, and soon give way to blueberries that fade into the forest. There are bright orange mushrooms with sesame seed-looking scales and orange ones with dark stripes and some that look like chocolate hand grenades with spikes. Lots of mushrooms; lots of moss. Now tiny little orange shrooms with orange stems. The woods love red and orange in the fall. "Taste me" the mushrooms seem to say, the bright thick red ones and the large perfect creamy white ones. The trail narrows and closes in, engulfing me in the lives of other species. Maybe there're bears here. My companion begins to make strange noises as a defense, but we soon emerge onto exposed bedrock and grasses, feeling safe in the open. Grasses are always in tough plant neighborhoods--I remember them along the roadways in Labrador and on cliffs near the sea. Habitats quickly change along the trail as I enter a verdant garden of tall mountain laurel, and then again break through the trees onto a slope of grass and moss-covered rock outcroppings, scraped flat and scarred by glaciers. 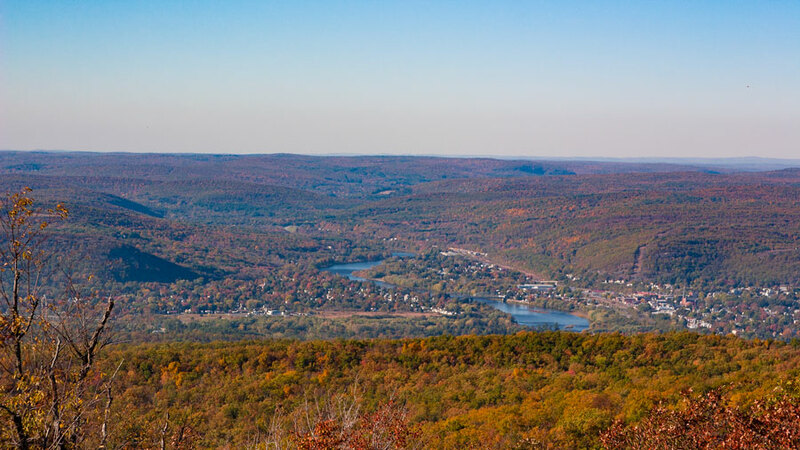 Port Jervis, New York in the blue distance is unveiled. I check out the rotting stumps and trunks of dead trees. I see turkey tail mushrooms on a log. It has brown concentric circles on the top and since the growing margin is white, I know it's fresh. And it's a white-rotter--decomposes just about everything, till there's not much to give back to the soil. On the downhill, I suddenly feel alone, almost lost, but soon the trail blazes reassure me. This is truly a wild path in New Jersey. Quiet. Close. Palpitating. Yet it's a short enough loop where you know you can't be lost. (The park naturalist has assured me she walks it alone frequently and has never seen a bear.) I come upon an unusual field of bracken fern, temporarily giving way to a regenerating understory of young chestnut oak, red maple and tall blueberry. I'm knee-deep in bracken fern now under a tight canopy, when not far away, the flapping of great wings stirs the woods. 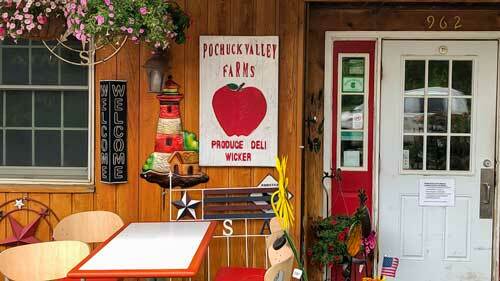 After what seems like a mile of uphill through familiar species, a peek through the trees reveals a familiar view--the unmistakable farms and valleys of Sussex County. Then what to my wondering eyes do appear, but a grove of silver-boled trees! Illuminating! A closer look reveals thick white lichens on the chunky trunks of chestnut oak. The forest has a magical feel. Anything can happen. Is that a person I hear in the woods? No, it's the high-pitched whirring of bugs. Although I feel the essence of timelessness in these woods, they are not older than a century. All but the highest ridges were farmed for lumber, fuel wood, crops, pasture or succumbed to fire or disease, favoring the growth of some species over others. Soon the ridge narrows and the Delaware River and Sussex County both come into view. The trail flattens and begins a descent. Noises from monument restoration sails down the trail and I know I'm out of the woods. A short walk along the road leads to the red/green blaze marking the trail to the right through the woods and its final flourish--the boulder field, another testimony to the great ice sheets that once covered the land. Monument Trail is the perfect walk for everyone. It's got everything in the fall. Blazing color of a mixed hardwood forest--yellow brilliance of American beech, the flame of red maple, and the russet shades of oaks. Mushrooms spring galore on the forest floor. Views to make you love New Jersey and an appreciation for mountains surround you. Let the stillness and quiet of this blueberry-clad mountain top forest on ancient rock fire your imagination! Lake Marcia and Sawmill Lake are sister lakes in High Point State Park. Sawmill Lake is geared to overnight use and Lake Marcia's pleasures are offered by the day only. Sawmill Lake has a wild look, manmade though it is. Once an Atlantic white cedar swamp, the lake was created by the Civilian Conservation Corp (CCC) in the 1930s. The campsites, stone and timber bathhouses, stone fireplaces, and wooden tent platforms scattered throughout the site were erected by the CCC. Take an easy walk around the lake on a narrow footpath that winds through campsites, crosses grassy areas made for sunbathing, limestone outcrops, tiny streamlets and pools of water with wetland plants and critters. On the hillside, the broken and scattered bedrock speaks glacier, and you can imagine it retreating, leaving rock and rubble in its wake. As you cross a built footbridge, there is a beaver dam to ponder. There are blackberry bushes, that in summer held fruit so ripe you could smell it in the air. If you want to spend the night outdoors with a feeling of the wild, but like the comfort of other people nearby, Sawmill Lake is a good place to be. From a campsite you can hike, bike, fish and catch the fall show of colors. Or just lay back, close your eyes, listen to the sound of the rustling leaves and feel the wind on your face. But a word to the wise: call for a reservation, for all 50 campsites get booked every weekend in the fall when the nights are perfectly chilly for campfires and the days flame with color. 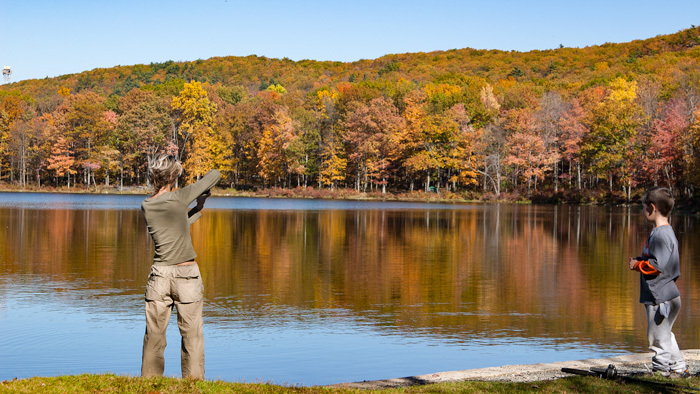 After campsites close October 31, the lake remains open for fishing and walking. There's great fishing here in the fall for native perch, sunfish, pickerel and bass, and trout stocked by the Division of Fish and Game, NJDEP. This 20-acre lake is the headwaters of the Big Flat Brook, one of the state's major holdover trout streams. Glacial lake Marcia floats below High Point Monument. 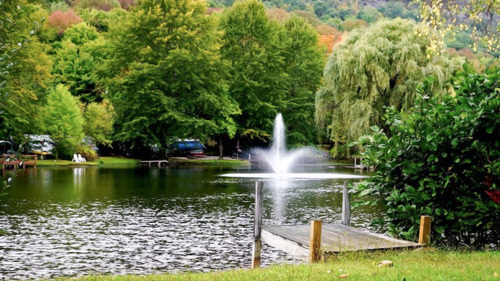 At an elevation of 1,570 feet, the 20-acre Lake Marcia rests on the crest of Kittatinny Mountain. It overflows into the Red Brook, then travels northwest to feed the Millbrook. The lake hosts activity during all seasons- swimming and sunbathing in summer, ice-skating and skiing in winter swimming, and nature hikes in fall and spring. For a fun walk around the lake, start at the beach house. Walk to the left along Kuser Road that leads to the Monument and the Atlantic white cedar swamp, one of the state's Natural Areas. The boulder-decorated stone wall adjacent to the road was probably built in the late 1890's with the High Point Inn, a summer resort. One can imagine wealthy vacationers arriving by horse and carriage on this lane, and parasoled ladies playing croquet by the lake. The romance of the lake includes its naming in 1855, after Marcia Smith, fiancee` of a state geologist. Conglomerate talus slope is a fun part of the walk around the lake. The footpath winds gently through native blueberry bushes--pick a few if there's any left, sweetfern--crush a leaf to sniff it's lavender-like scent (you'll know this knee-high shrub by its long scalloped edges)--and mountain laurel. Pockets of pearly-everlasting and sweet pepperbush with dried flower panicles dot the slopes--it looks like a garden. There are a few planted areas with tables for picnicking. The walk is easy to the monument at the top of the lake. It's gilt in beauty and a sense of wild, even in this tamed place. I can feel its pull to a greater force than what I see. Circling back, the trail traverses a talus slope with great slabs of quartz-encrusted conglomerate and some glacial erratics. Prepare to jump the rocks, or be light of foot and take your time, or turn around. There is no trail here, just well worn flat spots between the boulders. 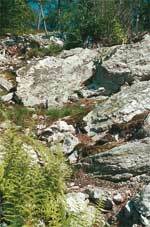 Soon the trail eases with mounds of moss spilling like water around the rocks and blueberry. As I approach the beach, I feel like a shipwrecked sailor emerging from an ancient sea of fossilized and glaciated rock. In the fall, the spring-fed, 50-foot deep Lake Marcia also invites fishermen with native species such as pickerel, bass and sunfish. High Point State Park was dedicated in 1923 as the first State Park in New Jersey. With 14,218 acres of woodland on Kittatinny Mountain, it includes the state's first Natural Area, the Dryden Kuser Natural Area, the highest elevation cedar swamp of its kind in the world. Lake Marcia, a 20-acre glacial lake has a beach with lifeguards, bathhouse and food. In winter it's converted to a cross-country ski center. 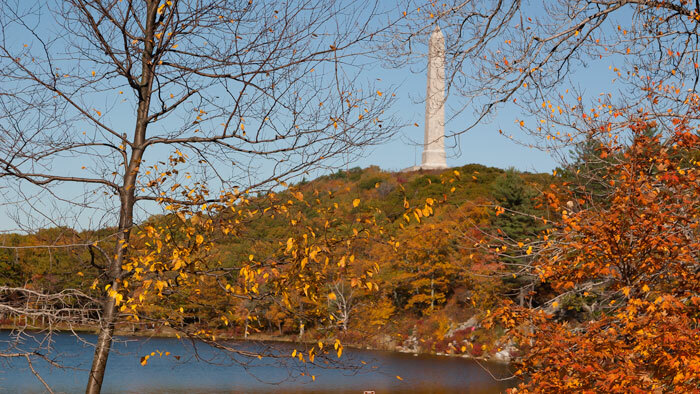 High Point Monument was built in 1930 and is dedicated to New Jersey's wartime heroes. 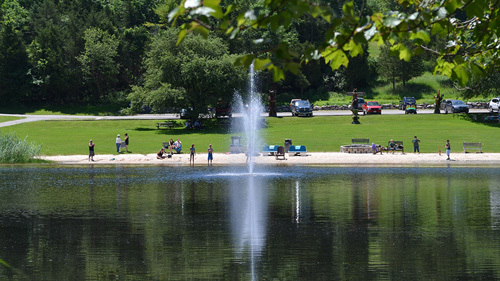 The park was designed so that all land to the south of Route 23 North has overnight facilities, such as camping, and day activities are conducted on the north side, such as swimming and day hikes. There are over 50 miles of trails, including Monument Trail. There are cabins at Steenykill Lake and campsites at Sawmill Lake. There's fishing, boating, skating, picnicking, hiking, skiing, hunting, and the Appalachian Trail. A drive for the weekend or day in the fall is a must, when the glories of High Point are at their height. 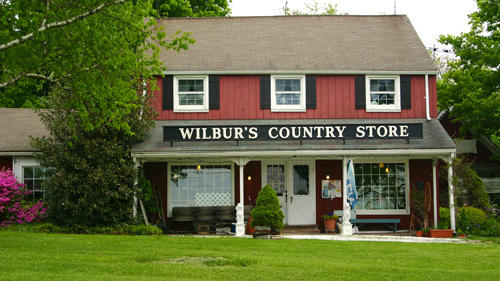 As you near the top of Kittatinny Ridge on Route 23 North, the park office is on the left. 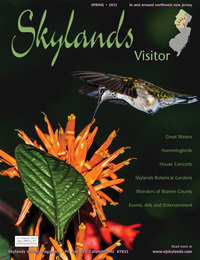 Stop in for maps of trails and roads and good info from the staff before continuing into the park.